Urban Angels: Speed Queen Is Back! At last! Speed Queen is not only back in Leeds but back in its natural home - The Warehouse. We missed Speed Queen because quite simply, there has been nothing else like it in the city because no-one can match the vision of its instigators - Kas and Suzy. And Urban Angels are back too! Suzy described us as being not only pencilled in for future dates, but inscribed in very "bright pink ink!" . 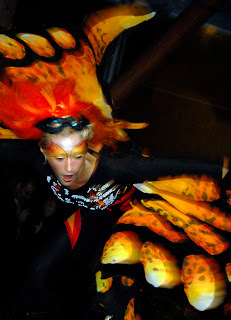 It's great to be back as Urban Angels performed at Speed Queen every Saturday night for round five years. Two Urban Angels - (myself) Deborah & Rachel donned stilts and danced into the wee small hours. Beyond the exurberism and flamboyance there is definitely something about the integrity of the night, the diversity of the clubbers; age, race, gender & sexuality are celebrated. Glamour, difference and a healthy smattering of deviance are at the core of Speed Queen. And it may sound corny but there is a real sense of a Speed Queen community or even family. James and David (Story of O), Kate B and her new man Jamie (met at the Speed Queen in July! ), Miss Nigeria aka Ms Odudu, Harry the Mover, Rob de Architect and all the regular DJ's and delicious dancers plus Cool Alex on Stilts, Boymatic Bong Dave and Charlotte - The Robot. And of course, all the lovely "Ladies". Last but not least, a special mention for Speed Queen virgin - John ("who drank all the gin?") Wootton. From a stilt dancers perspective (about 8 ft up!) everyone in the club makes you feel so appreciated. Clubbers at Speed Queen are gregariously gorgeous, full of flirty fun and voyeurism! And their healthy sense of playful spontaneity makes working there a joy. And they go out there way to help us on steps unlike typical "townies" who would prefer to trip you up or push their "mate" into you. We got snapped by Speed Queen paps but forgot our own camera please can we have some photos with you lovely people?! You can send them to me at contact@urbanangelscircus.com. Or give us a comment or even "like us". There are even more photos, video footage and info on our website Urban Angels Circus . Below I have added a gallery of images from our history at Speed Queen. There's lots for info' at Urban Angels Circus Enjoy! Speed Queen will return for New Year so keep your eyes on the hoardings, Speed Queen or info@speedqueen.co.uk because demand will outstrip supply.